Make your kitchen stand out with stunning kitchen countertops in Gurnee, IL, from our reputable store. We will partner with you to choose design features that work best for your space. Whether you’re looking to create an entirely new look or you simply want to accentuate your existing décor, one of the best ways to update a dining and food preparation area is with a set of new granite, quartz, stone or marble countertops. When you’re ready to make a major change in your kitchen with a minor investment, turn to us for a new set of countertops. Here at our countertop and flooring showroom we carry a broad selection of products that are crafted to make your kitchen shine. From quartz to marble and everything in between, our extensive collection of stone countertops is sure to please even those with the most discerning of tastes. Visit us today to learn more about the countertop installation process and get started on your remodeling work. We have proudly served members of the local community over the years and look forward to serving you with the countertop solutions you need, so be sure to get in touch with our design experts when you’re ready to begin. You spend a great deal of time in your kitchen, so it’s important to make it look and feel its best. From serving as a space for cooking food for yourself and others to entertaining your guests and loved ones, you use your kitchen in a wide variety of ways. For that reason, it’s important to ensure that your kitchen space stands out for all of the right reasons. When you shop with us for your new counters, we’ll guide you toward the best style for your personal preference while staying within the budget you’ve set for your project. Our stone, marble, and quartz countertops give you the option to choose from a wide range of materials depending on your financial and aesthetic goals. Regardless of the material you choose, you’ll have what it takes to expand the meal preparation area in your kitchen while enhancing the overall atmosphere of your cooking area. Available in a number of different materials and colors, the products in our inventory include options that fit every taste. Whether you have a rustic or modern kitchen, you are sure to find something you love when you shop with us. From cutting up vegetables to serving a hot tray of food, you need to know that your countertops will be able to hold up to every type of use in your daily life. At our local showroom, our sales team is happy to meet with you to discuss our products, so that you are able to choose the right option for your space. Our collection of stone countertops includes durable and beautiful materials in marble and quartz. 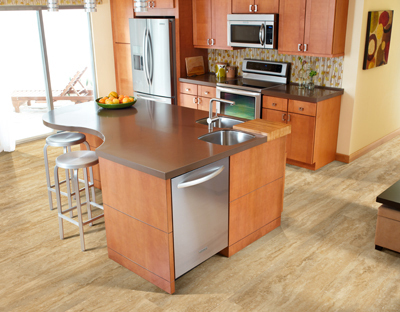 During your remodeling project, you may want to consider installing new flooring to match your new countertops. Count on us to help you select the best flooring, such as laminate and hardwood, which are sure to complement the look and feel of your home. Used to grace dignified homes for centuries, marble countertops are resistant to heat and offer some of the most classic and timeless looks available in the interior design industry. When maintained properly, they can also last for decades and continue looking as good as new for many years. They can also be resealed, which means that if you ever start to notice wear or damage from use, it’s a relatively simple matter to have them looking brand new all over again. Our staff is excited to learn more about your personal preferences and design goals so we can help you with your countertop needs at every step of the process. We gladly offer efficient in-home services and we have extensive experience in both residential and commercial applications. Our team of experts has been trained to match your personal preferences with the designs you’re sure to love, so you can be confident you’ll find the perfect countertops for your lifestyle when you visit our showroom. With our exclusive nationwide buying power, you’re guaranteed to receive the lowest prices on a wide range of countertops for your interior space. Get in touch with us when you’re ready to start searching for your new set of countertops and we’ll be happy to help you choose the style you’re sure to love. Contact us to learn more about our selection of stylish and affordable kitchen countertops. We serve clients in Gurnee, Illinois, and cities in Lake, McHenry, and Northern Cook Counties.